A new table sequence can be generated by retrieving data from a database, or based on a sequence or another table sequence using new function. A different table sequence can be produced with derive function by adding one or more columns to an existing table sequence or record sequence. As can be seen from the above results, A.new() function loops through every member of A to compute the expressions to get a new record and and enter it into the new table sequence. 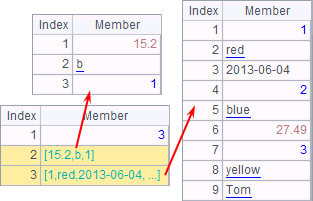 The new function can reference members of A; if A is a table sequence or a record sequence, it can also reference the field values of the records for computation. By default, the field names of the new table sequence are the expressions for generating the table sequence, for instance, age(BIRTHDAY). For the fields of the new table sequence that directly migrate from the old one, they will use the old field names if they aren’t given new names, like EID and GENDER, which are also expressions for generating new fields. You can retrieve only the desired data to create a new table sequence. As can be seen, to rename a new field in the new function, one just need to write the desired name after the expression for generating the field, with a colon used to separate the name and the expression, like NAME+" "+SURNAME:FullName, which means that the employees’ full names are obtained according to the NAME and SURNAME fields of the records in the original table sequence and the new field is named FullName. 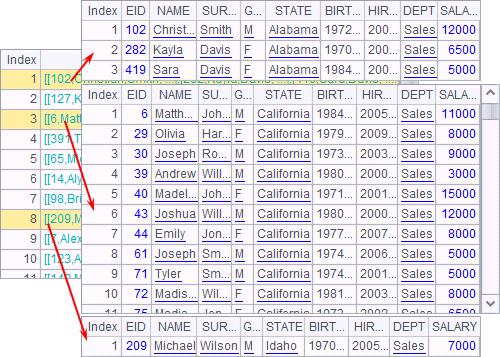 It can be seen that A4 only gets the employee names in the original table sequence, rather than the newly obtained full names. The results are sequences instead of table sequences. According to this, generally the loop function A. (x) generates a single piece of data each time. An age field derived from the BIRTHDAY field is appended to the original fields. The new field uses the expression age(BIRTHDAY) by which it is generated as its name because it hasn’t been renamed. Actually the derive function can be regarded as the simplified form of the new function. It also generates a new table sequence when executed. That’s the reason that A1’s table sequence can remain unchanged after A2 finishes creating the new table sequence. It is clear that all the fields of the table sequence in A2 have been copied, only with the new field appended. In A3’s expression, the new field is named FullName. Similarly, the operation in A3 doesn’t affect the result of A2. It can be seen that, without an expression, the program will generate a null field and return it. It has the same effect as adding fields step by step. The expression in A3 not only adds two fields to the original sequence at once, but references the the newly-added Age field in the Group field. With derive function, a field can be referenced by a field generated later than it. By the way, in esProc, to concatenate a real number with a string, first the real number should be converted to a string. This method is more efficient than the multi-step execution of derive operations because it is unnecessary to re-create the records in the new table sequence and only value assignment is needed. Similar to new function, derive function can work with @i option, too. When computing a to-be-added column with an expression, a record won’t be added if null value appears. So the new function can not only reference the fields of the original table sequence, like EID, but also the newly-generated field derived through the derive function, such as FullName. It needs to be made clear that this time derive function is executed based on the result of new function, and thus the derive function can’t reference fields of the original table sequence, like NAME, SURNAME, and etc.